Our customer’s core activities are the provision of contract crushing and screening services to the mining industry around Australia. To control the feed to their screen, the conveyed material is put through a Schenk Vibratory Feeder. 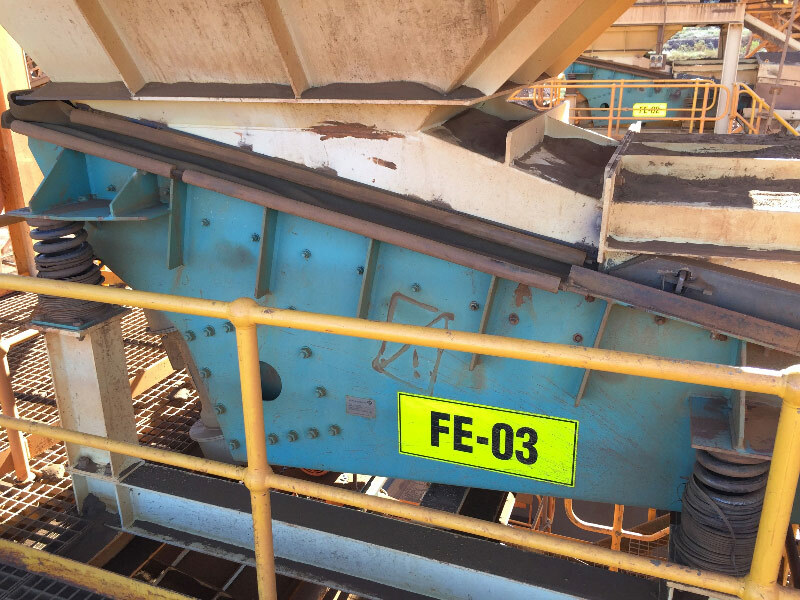 However, due to the level of product build up occurring on the existing Bisalloy plate chute lining (20mm hardox 450), our customer had to stop the plant and deploy resources 3-4 times per shift to jack hammer the iron ore manually. Also given the impact from the 2.5 metre drop height and the sliding abrasion experienced in this particular materials handling environment, our customer had to replace the existing conventional chute lining every 12 weeks. As well as the cost of the replacement lining, the plant’s crushing productivity was being compromised. To fix this problem, Kinder Australia suggested the use of its high performance K-Superline® Polyurethane Lining System, specifying a B93 durometer hardness rating and 1 inch thickness to suit this environment’s high levels of impact and sliding abrasion. Our customer found that the installation process for the K-Superline® was far less complicated than the Bisalloy plate as it required no welding. After counter sink-holes were made into the plain backed polyurethane, the K-Superline® was simply and securely bolted into place. Also, because the polyurethane sheets are much lighter to lift than Bisalloy sheets, any manual labour safety risks were also reduced during the installation. K-Superline has now completely eliminated material build up inside the feeder chute, and so has stopped the need for any jack-hammering on site. Our customer also observed that the K-Superline® provides 50% more wear life and so is completely delighted with their investment in a correctly specified durometer of K-Superline® high performance polyurethane sheet lining. Overall, our customer is seeing major cost gains from switching to K-Superline®.